Siberia is a fascinating place. It’s utterly remote, far from everything, synonymous with ‘the middle of nowhere’. It’s frozen for more than half of the year, just a little south of the Arctic Circle. And yet it’s also a lush, green place, for a few months of the year at least. It has a rich cultural legacy, and incredible geological features, the first of which must always be the stunning Lake Baikal, the world’s deepest lake which stores around a fifth of our fresh water. On the edges of Lake Baikal, at the outskirts of Listvyanka, the small town that is most people’s point of entry to the lands surrounding the lake, lies a small group of abandoned buildings. In start contrast to the well-tended homes of Listvyanka, these buildings feel like they’re being reclaimed by the wildness of nature, as they gradually crumble and give way to winter’s harshness. But someone, or perhaps many someones, have chosen to turn these buildings into canvas. Strolling through this run-down corner of town, beautiful works of art leaps from the walls. A face smiles next to an empty window frame. A purple squid has claimed the hull of an overturned boat. Snow is swept in drifts against walls of peeling yellow and cream. Raw wooden windowsills gaze out upon the vastness of the lake, their glass panes long gone. And nearly everywhere you look, a splash of bright colour leaps from the decay. Some seems like simple vandalism, much is unquestionably art, all of it is beautiful and interesting against the stark landscape on this frozen edge of the world’s deepest lake. Street art is not something I expected to find in Siberia. Street art is such an urban phenomenon, and Siberia just isn’t an urban place. Even it’s largest city, Irkutsk, an industrial city framed by lacy woodwork and harbouring a surprisingly sophisticated culture, doesn’t feel ‘urban’ by any means. 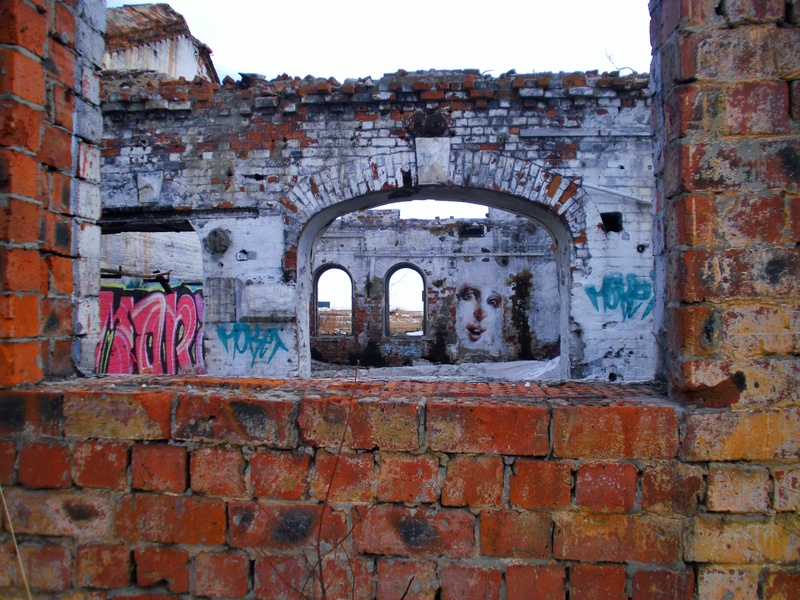 Yet here, at the edge of one of the world’ great wildernesses, this art form bursts forth from otherwise abandoned buildings. It’s hauntingly beautiful, and almost eerily fascinating. Have you ever encountered unexpected street art? Where were your most surprising finds? I love street art in cities. There is so much meaning to graffiti other than the beauty of the paintings. You need to take it all in and try to decipher what the artist was trying to say. I know, right? It’s such an interesting insight into the heart of the city. The really fascinating part about this is that it wasn’t even in a city, where you’d usually find such things, but in a bunch of abandoned buildings at the edge of a small town. Some people there have some real artistic skill! What an eery building but awesome street art. I love the face with the big brown eyes. We love exploring cities and coming across street art. There are a lot of talented people out there. Thank you for sharing Martina. My too – I must have taken a dozen photos of that face, from different angles and through windows and things. It was such a surprising find. It’s amazing how much character people can put into a few brush strokes – I wish I had that kind of talent!